Tarazed's Many Hobbies: Blankets are big! Yeah, I've started my first blanket, and am just now starting to realize that blankets are big, and that's a lot of square inches to be making by hand. 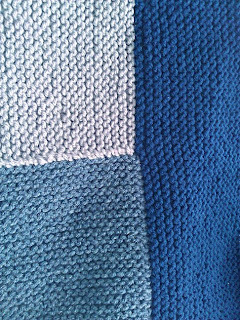 I'm making the Moderne Log Cabin blanket in 3 shades of blue and a grey in Red Heart Comfort, because it's not a bad feel for acrylic, and I can get a lot of it without breaking the bank. The picture to the left is where the first 3 blocks join up. The corner isn't quite straight, but I'm also still figuring out how to pick up stitches that looks good to me. I think I have it figured out now, but I still have about 31 ridges, so 62 rows, left to go before I finish block 3 (the dark blue). I had hoped to finish that block today, but it's already starting to look more like tomorrow. In the same vein, I was kind of hoping to finish this for Christmas, not as a gift, but as a handy deadline so we can actually use this blanket this season, as I'm hoping it will fit on our queen size bed (what was I thinking?!) But maybe for New Year's Day instead? We're looking at spending 4-5 days for Christmas at his parent's place, so lots of knitting time, I hope. I will try to post more updates on the blanket, and other things as they cross my needles. I have some rather large plans for 2012, the hard part is picking which plans to do, because I can't do them all in one year!